I got a Pizzelle maker for my birthday. 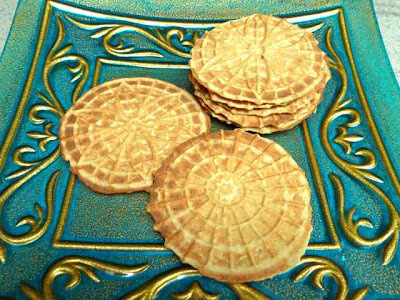 A Pizzelle is a light and crisp Italian cookie often flavored with anise. I will make those soon. Now it is hot here and I was imagining a GF waffle cone with ice cream. There are never GF cones at ice cream stores so I always get my treats in a paper cup. Never having made either Pizzelles or crispy waffles for cones I did not know what recipe would work for a cone. 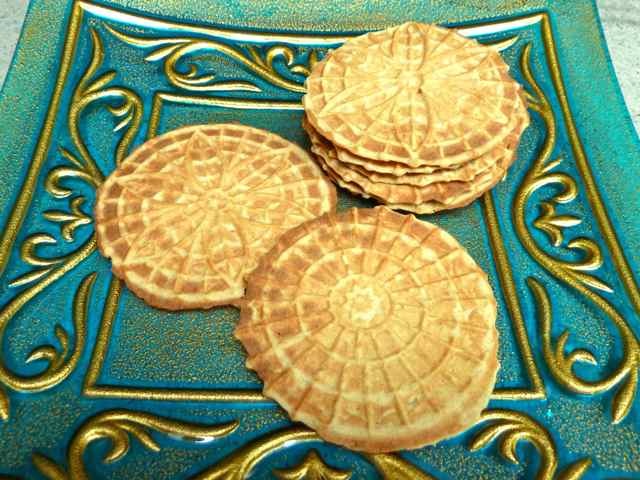 I went surfing online and found this recipe, by Terese Allen, for Belgian ‘Good Year’ Cookies on the Organic Valley website. Good Year cookies or Lukken are crisp Belgian waffle cookies made with butter. The comments stated that they tasted very similar to those Jules Desptrooper Butter Crisp cookies that you can buy in stores. I can still remember how good those cookies tasted and decided to convert that recipe into a gluten free one. 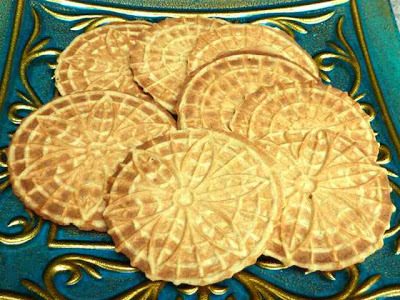 This recipe tastes similar to these butter cookies. I found that weighing out the dough into 1 ounce balls worked well in the pizzelle maker. 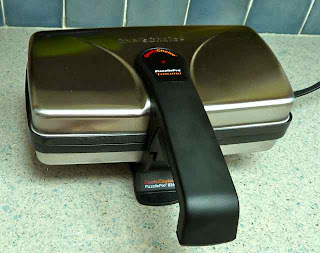 The cookies cook in about 30 seconds, so use a timer. My first few cooked for a minute and were way too brown, yet not burned and still quite tasty. It is important to place the ball of dough to the rear of the center of each pizzelle plate mold as the dough is pressed forward by closing the lid and dough will come out the front and sides if you start in the exact center of each mold (guess how I know this...). While the cookies are hot they are soft and pliable and when cool they are hard and crisp. They must be shaped while still hot. I tried to make a cone shape, but was not able to do this successfully. I may need to get a special cone shaped form to do this well. I made bowls by placing the hot cookie inside a small bowl. After it was cool the cookie bowl kept its shape. I plan to have ice cream in the bowls. 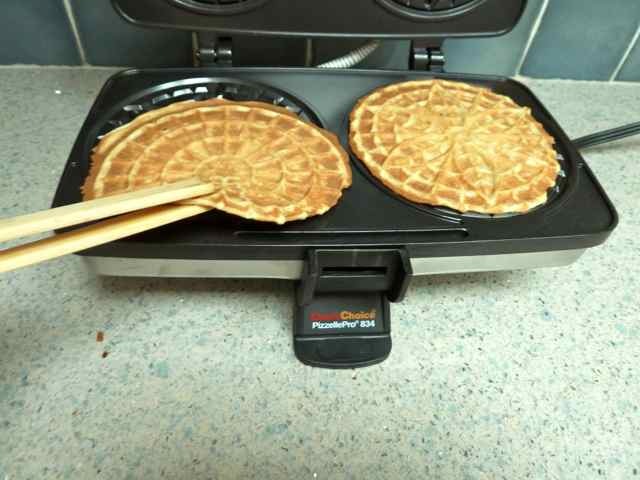 You can use a Lukken maker or a Pizzelle maker. I just happened to have a Pizzelle maker and I like the pretty patterns it makes. Lukken makers have a plain waffle pattern. Both types of cookie makers sell online for about $50-$60. 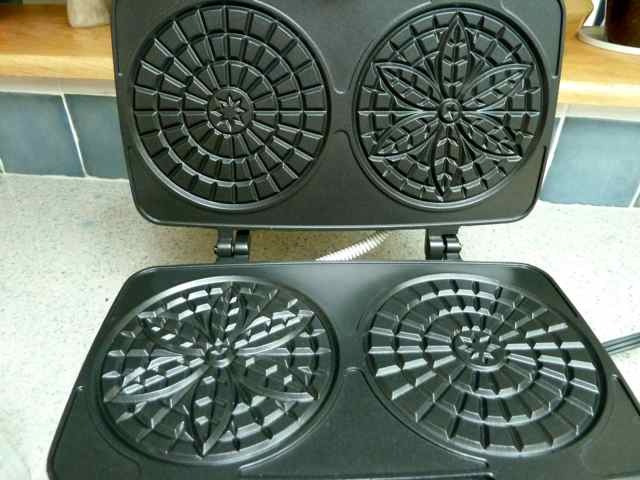 The inside of the Pizzelle maker with pretty patterns. The type of butter you use will affect the outcome of the cookies. Be sure to use a really good tasting butter. I used Organic Valley unsalted butter which tastes wonderful. European style butters will also work well. In a small bowl add flours, salt and xanthan gum and mix well with a whisk. Set aside. In a large bowl cream butter and sugars together until well blended. Add the eggs and vanilla and mix together well. Stir in the flour mixture until well incorporated. The dough should be stiff. The stiff dough ready to go into the refrigerator. Place in the refrigerator for a few hours or overnight. Form dough into balls the size of walnuts. I used a scale to weigh out 1 ounce pieces of dough and rolled them into balls. 1 ounce balls of dough ready for placing in the cookie maker. Heat up the cookie maker. 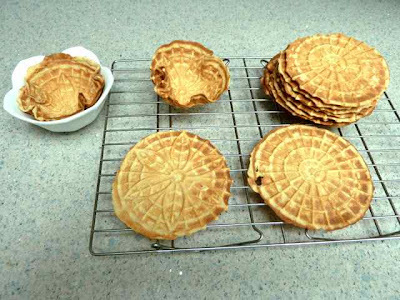 On the Pizzelle maker there is an indicator light that goes off when the cookie iron is hot enough. 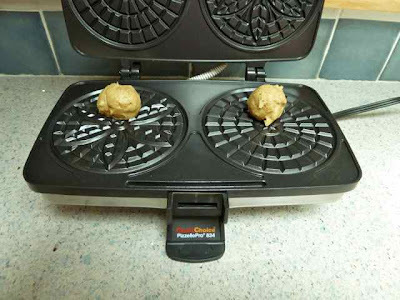 Place a ball of dough just to the back of the center of each circle plate of the cookie maker. Close the top until it locks. Please note that the balls of dough are placed just behind the center of the circle. Cook until lightly golden, 30 seconds on my machine. The time will vary according to how cold and dense the dough is and how hot the machine gets. Remove the hot cookies with tongs. I had wooden tongs for toast that worked well. Place the hot cookies on a flat rack to cool. The cookies are soft when hot and will be hard and crisp when cooled. Cookies in front cooling on a rack. The pile in back are already cool. Removing the cookies with wooden tongs. 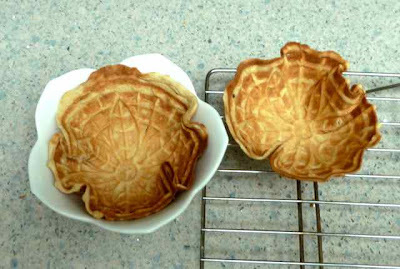 You can place hot cookies into a small bowl to make edible waffle bowls. Hot cookie placed in a bowl to form a cookie bowl. When cool the bowl will keep its shape. Store cookies in an airtight container. You can freeze the cookies also, for later use. GLUTEN FREE BELGIAN LUKKEN Makes about 22 cookies. Ingredients 1 stick (1/4 lb.) Unsalted Butter - use a good quality butter (I used Organic Valley) 7 Tbs. Sugar (I used evaporated cane juice crystals.) 1/4 cup Light Brown Sugar (I used organic brown sugar.) 2 large Eggs 1/4 tsp. Vanilla Extract pinch Sea Salt 1 cup Sorghum Flour 1/2 cup Tapioca Flour 1/4 cup Chickpea Flour 1/2 tsp. Xanthan or Guar Gum Directions In a small bowl add flours, salt and xanthan gum and mix well with a whisk. Set aside. 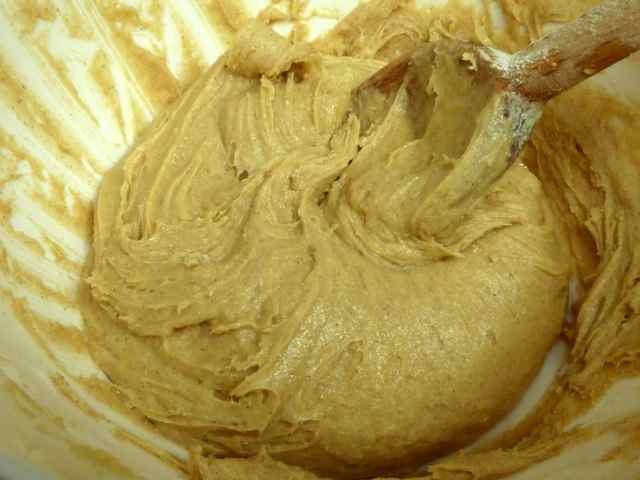 In a large bowl cream butter and sugars together until well blended. Add the eggs and vanilla and mix together well. Stir in the flour mixture until well incorporated. The dough should be stiff. Place in the refrigerator for a few hours or overnight. Form dough into balls the size of walnuts. 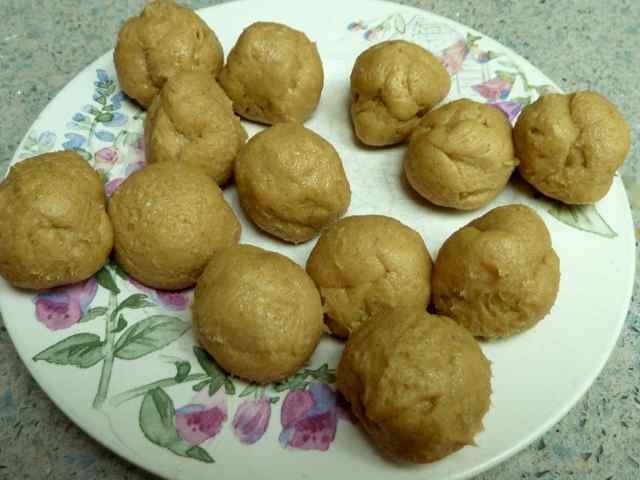 I used a scale to weigh out 1 ounce pieces of dough and rolled them into balls. Heat up the cookie maker. On the Pizzelle maker there is an indicator light that goes off when the cookie iron is hot enough. Place a ball of dough just to the back of the center of each circle plate of the cookie maker. Close the top until it locks. Cook until lightly golden, 30 seconds on my machine. The time will vary according to how cold and dense the dough is and how hot the machine gets. Remove the hot cookies with tongs. I had wooden tongs for toast that worked well. Place the hot cookies on a flat rack to cool. The cookies are soft when hot and will be hard and crisp when cooled. You can place hot cookies into a small bowl to make edible waffle bowls. Store cookies in an airtight container. You can freeze the cookies also, for later use.